Energy and Natural Resources Minister Berat Albayrak has announced that the tender for the 1,000 megawatt-photovoltaic solar power plant, which will be established in Konya's Karapınar district, will be held in December. Poised to be the largest of its kind in the world, the solar power plant will pave the way for a new period in Turkey's use of renewable energy resources. The United States, China and many European countries aspire to compete in the tender, which will attract $1.3 billion worth of investment to Konya. The solar power plant, which will be constructed on a nearly 2,000-hectare area, will produce 1.7 billion kilowatt hours of electricity, which is enough to be used in 600,000 houses. 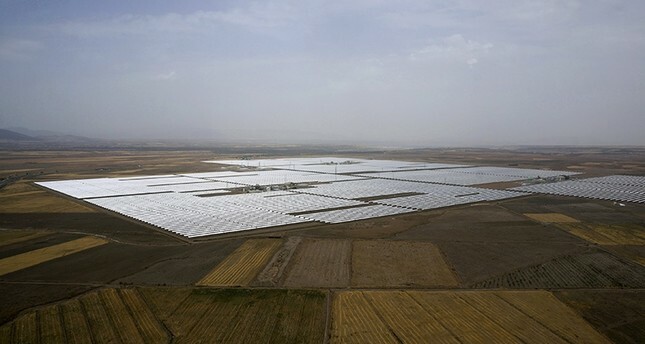 Touching on the significance of the Karapınar solar farm among other renewable energy resource areas, Albayrak said that this is one of the first energy projects of its kind, which the Justice and Development Party (AK Party) government introduced through its perspective that, "There is no rest for the weary." Successful bidding companies will have to establish a solar power plant that is capable of producing at least 500,000 megawatts of energy a year. The power plant will be able to export energy in the upcoming years. The project stipulates using domestic technology, research and development (R&D) studies and employing 80 percent domestic engineers. All processes required to create a solar model will be actualized in Turkey. This is a stipulation that will pave the way for technology-based domestic production in the country. The government will encourage the successful bidding companies to start energy production as soon as possible considering that the 15-year period of guarantee of purchase will include the production process. As such, the power plant will start producing domestic energy toward the end of 2018. The government also laid down a condition to produce at least 65 percent domestic energy in the first phase and 75 percent in the second phase. The power plant will provide jobs for at least 1,000 technical staff, including 700 during the construction process, 350 in the operation process, 350 in R&D studies and 100 in engineering studies. The investment will create a competitive environment in energy prices, as well as reducing energy costs. Investment options include partnership between domestic and foreign companies. Turkey is set to hold a tender for a similar project in wind energy in the first quarter of 2017. Underlining that Turkey has to benefit from domestic resources, especially coal, as well as domestic technologies in environmentalism, Albayrak said the country continues to grow through investments despite being poor in energy. It will further focus on domestic and renewable energy resources. With respect to the wind power plant tender, the government will offer alternative areas, which can attract investors' interest as production fields. The tender will be based on a win-win principle, which will appeal to investors.